The Omaha World-Herald ran an interesting piece this week with Erin Golden’s “Life beneath the street: Downtown sidewalks conceal a hidden world underground.” The article details the condition and current use (or non-use) of several giant vaults that remain under the streets and sidewalks of downtown Omaha. Some of the below-ground history is clear. The vaults were used for storing coal and merchandise, which could be dropped in through chutes or lowered through metal trap doors built into the sidewalks. But there are other possibilities, too. In the late 1800s and early 1900s, spaces like Hawkins’ were directly below the heart of an area known as the Sporting District, where a crime boss ran bootlegging and prostitution operations. My novel contains several pivotal scenes in tunnels under the city–the crime boss ones–so this is pretty interesting to me. From what I’ve read, I don’t think vaults like the one pictured had much to do with criminal operations. Pimps and bootleggers were more concerned with secrecy and transportation, less so with storage, so narrow tunnels were favorable. 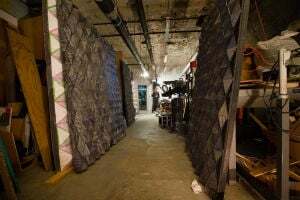 As is fictionalized in my book, tunnels were used to connect hotels with brothels, so patrons could move discretely without being scene walking in the front door of the house where they took their pleasure. Several of Tom Dennison’s offices and saloons he ran were rumored to feature tunnels as well, to facilitate a quick get-away if necessary. Society as a whole seemed to be obsessed with tunnels and secret underground vaults those days. Many people had them dug under their yards, to their garages, elsewhere. Big retail stores like the Brandeis had tunnels that connected from the bargain basement level to nearby banks–so customers didn’t have to go out into the weather should they need to make a withdrawal. “Tunneler” was a pretty common professional during these times too. As a dangerous job that demanded skill, I’m sure it paid well. Thinking of this reminds me of the scenes in The Jungle when Jurgis Rudkus joins the project to dig the Chicago subway. Or, more recently, Colum McCann’s captivating portrayal of the sandhogs who tunneled under the East River to connect Manhattan and Brooklyn by rail in This Side of Brightness, my favorite McCann novel. At any rate, I’m pretty jealous of Phil Hawkins, the artist whose kept a studio in one of these vaults the past few years. Not that I’d want to give up my cozy home office or anything, but that’s awesome. This is such an interesting topic! I love learning about the hidden or covered-over portions of cities. Your very first link goes to a 404 error, and I was wondering if the page had been updated? I’d love to read more about this. Thanks for the heads-up, Kristen. Looks like OWH removed free online access.